Franmil Reyes, Vladimir Guerrero Jr., Juan Soto and Eloy Jimenez all dominated the headlines last week -- and justifiably so. Three of MLB.com's top 30 overall prospects showed why they're each considered among the game's best young hitters, while Reyes teed off for a mind-boggling eight homers in five Triple-A games. Chances are, most Minor League followers know all about their exploits. Thomas Jones might be a bit more under the radar, but at the rate he's going, he may not be for long. The Marlins' No. 25 prospect homered four times in his first three games with Class A Greensboro to take home South Atlantic League Offensive Player of the Week honors for April 30-May 6. It's the first Player of the Week award of Jones' Minor League career. After spending April at extended spring training, the right-handed slugger teed off with a three-run shot in his first at-bat of his Grasshoppers debut last Wednesday against Hagerstown and hardly looked back. He went deep twice more Thursday against the Suns and added another blast Friday against Greenville. Over that three-game stretch, Jones went 6-for-12 with four homers, a double, six RBIs and a stolen base. He ran cold over the weekend, going 1-for-8, but finished his first week in a Class A uniform with a .350/.409/1.000 line through five games. His slugging percentage and 1.409 OPS were highest among Sally League batters with at least 20 plate appearances last week. With numbers like those, Jones gave his prospect profile a major boost. 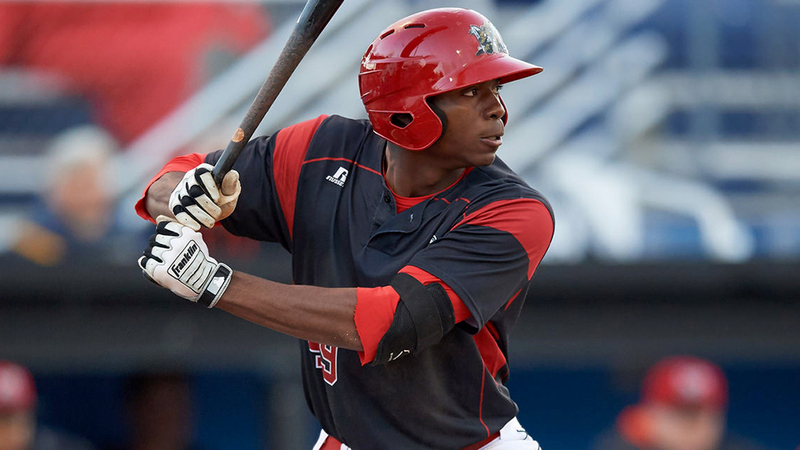 The Marlins took the raw outfielder in the third round of the 2016 Draft out of Laurens (South Carolina) District 55 High School and signed him for $1 million ($258,300 above slot) because of his athleticism and toolsy potential that had earned him a commitment to Vanderbilt for the following fall. But Jones' skills failed to translate at the pro level out of the gate, hitting .181/.315/.282 with two homers in 68 games for Class A Short Season Batavia. His 32.2 percent strikeout rate was third-highest among the New York-Penn League's 61 qualified hitters, and his 89 wRC+ was 10th-lowest. Despite a slow introduction to the Minors at the plate, the rest of Jones' tools have kept him ranked among the top 30 prospects in an improving Miami system. A former safety with Division I offers, Jones has plus-plus speed that works as an asset in both the outfield and on the basepaths. His arm is also solid enough that the Marlins allowed him to play all three outfield spots last season, though center remains his primary position. With a 40 grade from MLB.com, his power was considered his weakest tool entering 2018, yet he's already doubled his 2017 home run output in less than a week. In a system that's already graduated Lewis Brinson and has Magneuris Sierra and Monte Harrison waiting in the wings, the Marlins aren't in any rush to get another toolsy outfielder to the bigs, but Jones is doing all he can in 2018 to stand out among that group.